If you want a very special way to celebrate the end of a year, consider enjoying a party train. Whether you go for fun, food, luxury or all three, a train ride can provide the perfect way to ring in the new. But book early: these popular events fill up quickly and you don't want to be left at the station. An elegant dinner, actors, music, and dancing will entertain you into the New Year. 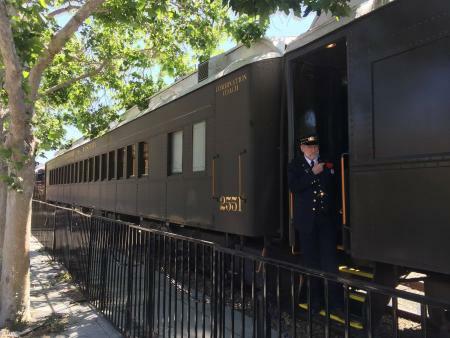 This railroad is located in Fillmore, CA, and New Year's Eve is among their most popular evening for visitors. The ride is 4 1/2 hours (8 p.m. - 12:30 a.m.), and a Champagne toast and party favors are included. Tickets are $110 for over 21 only. This is a 2-hour, 20-mile pizza and pop trip (for families) or wine and cheese trip (for over-21 travelers), which includes fireworks. The event starts at 10:30. Tickets for Pizza and Pop run about $20 for children, $30 for adults, and $25 for seniors; wine and cheese tickets were $35 for adults and $30 for seniors. The train leaves from the Nelsonville Depot in Nelsonville, OH. This train has been funded, managed, and run by volunteers for 40+ years, so when you choose the Pizza and Pop option, it's a friendly and family-oriented event. Michigan's Old Road Dinner Train claims to be the oldest operating dinner train in the U.S., and it's still going strong. Their New Year's Eve trip includes dinner, favors, and old-fashioned charm. 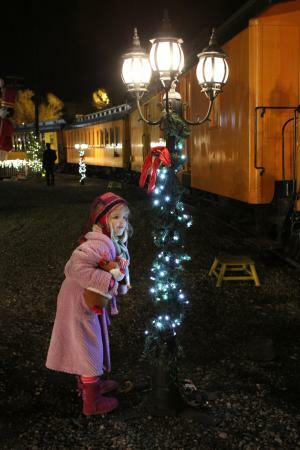 Their trains run the old Blissfield or Erie and Kalamazoo lines, from 7:30 - 10:30 p.m. on December 31; although prices vary annually, expect to pay at least $66 per person and up for the party. This 3-hour round trip begins in Canon City, CO, and travels through the Royal Gorge region along the Arkansas River. A three-course dinner with complimentary glass of wine was $119/person (8 years old and up), while a seat in the Observation Dome was $129 per person. There is an open air car where you can enjoy the night skies. Tables are for 4 people, so if you are alone or with a companion, you will be seated with other travelers (you also have the option of paying an additional $119 for a private table for two.) Plan to arrive 45 minutes early for boarding before the 6:30 p.m. departure. This is not strictly a dinner train, but it's lots of fun for families looking for a New Year's Eve jaunt. The railroad offers a New Year's Eve Polar Express, a trip based on the beloved children's novel, which whisks you off to the North Pole. Families are welcomed aboard to enjoy hot chocolate, snacks, a train ride, meet characters from the book, and listen to readings. Tickets vary depending on fare class, between about $40-67 for adults, and $30-57 for children. There are two trains to consider if you are looking for a luxurious New Year's Eve outside of the U.S. The Winter Rail Trans-Canada Tour offers a spectacular 10-day tour and a chance to experience winter up north, with luxury accommodations, food, sightseeing, and if you book it, New Year's Eve celebrations. Prices begin at $3,300 per person. The Belmond British Pullman tour leaves from Victoria Station, London, for an evening's fine dining, tableside magic, and other treats. Dress is strictly black tie, and prices begin at $550 per person. 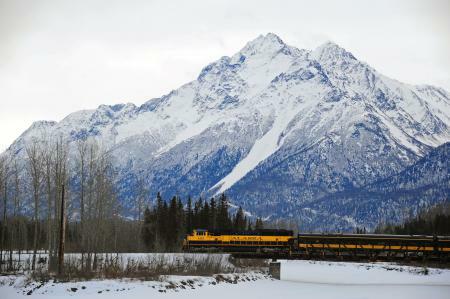 Alaska Railroad does not feature a specific New Year's Eve event, but the Aurora Winter Train offers trips between Anchorage and Fairbanks; if you are lucky, you may see the northern lights while welcoming in the year. If you want to combine a vacation with a trip, check out Amtrak to see what trains are traveling on December 31 and which vacations can be booked in your favorite city. 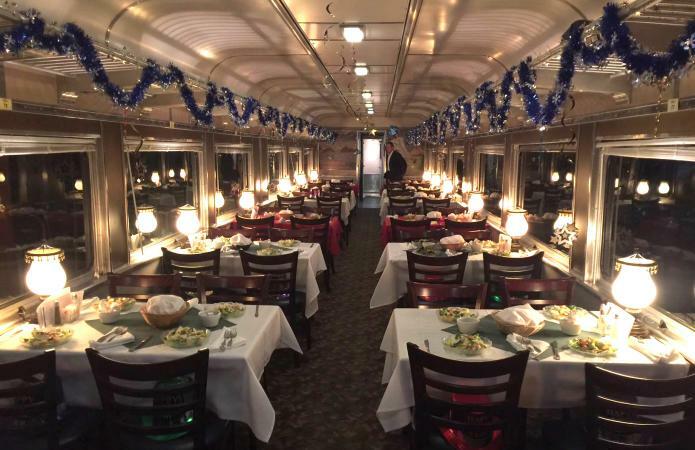 The trains do not always list special events, so ask about any New Year's Eve celebrations when you book. 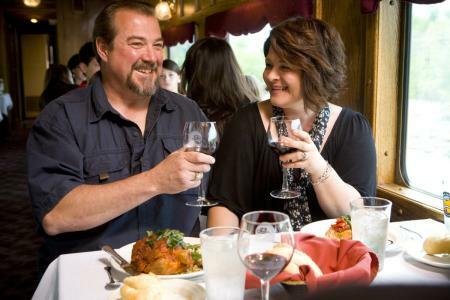 Check out this dinner train guide, which lists active trains and links you to their sites. And since trains change their events annually, you should call and check to see whether a New Year's Eve trip is scheduled, regardless if one is listed or not. Reserve your ticket early. Popular train parties fill up fast, sometimes weeks in advance. Know the details. What times does the train board and depart? What is included in the ticket price? What kind of seating can you expect? Since you have to book ahead, try to ask as many questions as possible when booking. If you are going to drink, have a plan for getting home safely when the ride is over. Dress appropriately. Some trains will require formal or semi-formal attire. Gather a group of friends or family. Some trains give you the option of reserving a family or group table or even a car. Ask before you book to make certain you are all seated together for the celebration. New Year's Eve by train is a wonderful way to recall fond memories and make new ones. So Happy New Year, and all aboard for a lovely evening.